Goalkeeper Simon Mignolet has been dropped "indefinitely", says Liverpool boss Brendan Rodgers. Brad Jones replaced Belgian Mignolet for Sunday's 3-0 defeat against Manchester United and the Australian will retain his place for Wednesday's Capital One Cup tie at Bournemouth. "I felt I had to change it because we have to find solutions throughout the squad to be better," said Rodgers. "I said to Simon that it's for an indefinite period." 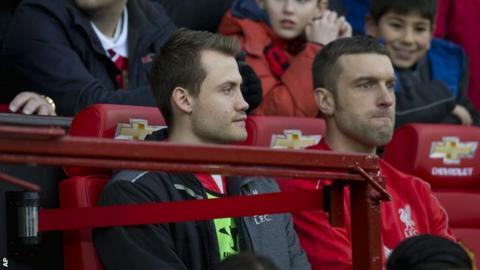 Rodgers was pleased with the performance of former Middlesbrough goalkeeper Jones, 32, in the defeat at Old Trafford. The Northern Irishman now hopes £9m signing Mignolet, 26, can recover his best form away from the spotlight. "Simon's been fine, he's a really good professional," said Rodgers. "I spoke to him the other day and he accepted it and understood it. "It can sometimes happen to a keeper where you come out of the firing line and it can help you and allow you time to reflect. "Brad's a very capable keeper so he was always going to play in the Bournemouth game anyway." Rodgers took positives from Liverpool's creativity against third-placed United. The visitors carved out 19 chances to United's 11 and had nine shots on target - all of which were repelled by goalkeeper and man-of-the-match David De Gea. "The most important thing for me today was we looked like scoring," said Rodgers after the match. "Over the course of the season, we haven't been creative enough. "I didn't think it was a 3-0 game. I thought we were the better team in the first half but we gave away disappointing goals. "I think it tells you everything that their goalkeeper was man of the match. Our creativity was good today, probably the best all season. "We know what the solutions are but we have to keep working and hopefully the confidence will return." Liverpool dropped to 10th in the Premier League after Tottenham beat Swansea in Sunday's late game. The Reds face a trip to Championship leaders Bournemouth in the League Cup quarter-finals on Wednesday. Then they take host Arsenal at Anfield on Sunday before festive fixtures against Burnley (away) and Swansea (home).